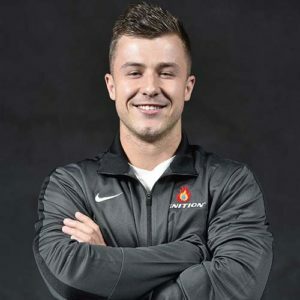 Derek joined Ignition APG as a Performance Specialist in May of 2017. Berry serves as the Head Strength and Conditioning Coach for Turpin High School, and assists the Cincinnati Bengals’ Strength Staff. In his time with Ignition he has assisted with the NFL Combine Program, NFL Veterans’ off-season training, and served as the Director of Strength & Conditioning for the Cincinnati Angels AAU Basketball Program. Before coming to Ignition, Berry worked as a student intern at the University of Cincinnati for 2 years; he worked with football, men’s & women’s golf, men’s & women’s swimming and diving, men’s & women’s soccer, and cheerleading. Before graduating from the University of Cincinnati, Derek spent a summer in Lexington assisting the strength & conditioning staff at the University of Kentucky (football). Derek received his bachelor’s from the University of Cincinnati in exercise & fitness, and is also nationally certified by the NSCA (CSCS) and USAW (Level 1 Sport Performance Coach).